Want to jumpstart your fundraising but aren’t sure where to begin? Wondering how to boost support for your cause? Struggling to prepare your organization for a capital campaign? 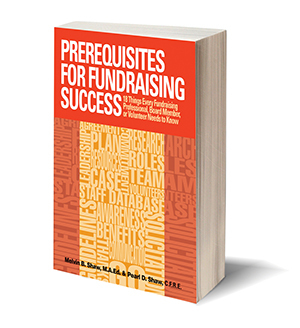 Our new book Prerequisites for Fundraising Success walks you through the steps for planning, launching, and maintaining successful fundraising programs. This user-friendly, workbook-style guide gives you the fundamentals to build a stronger organization and more secure financial future. Learn strategies designed to take you from where you are to fundraising success!